1. Sisley Nutritive Lip Balm - I am already a fan of Sisley products, and this lip balm has been on my wish list for years. Though I do prefer a squeeze tube or twist up application rather than sticking my fingers in a pot, there are too many amazing formulas to pass up simply because of logistics. This is one of them. The texture is a balmy oil that works well not only at night as a treatment, but as a lip prep in the morning and throughout the day to keep my lips hydrated. Not all lip balms work well in all these circumstances, but this one manages to tick all the boxes. 2. Sara Happ Lip Scrub in Creme Brulee and Lip Slip - I LOVE lip scrubs. Especially the sugary ones. And no it has nothing to do with the fact that I have a major sweet tooth and enjoy licking it off my lips - ok, it actually does. Lol. This Sara Happ Lip Scrub tastes delicious, is soft and gentle while still being effective at exfoliating my lips. The Lip Slip was actually the real surprise to me because I was expecting an ordinary balm. Yet this has a slight shine to it with much more emolliency that makes it feel like a gloss/balm hybrid. I enjoy using this as a makeup product because it neutralizes the red in my lip, adds a hint of shine and acts as a great base for layering a lip gloss on top. This balm falls into a category all its own! 3. First Aid Beauty Ultra Repair Intensive Lip Balm - I still stand by First Aid Beauty as one of my favorite skincare brands ever. Their products are continuously effective and work for many different skin types. This lip balm was by far the most unique one of the bunch because it is so dense, almost wax-like with a matte finish. This is a true treatment lip balm with ingredients like colloidal oatmeal, beeswax and propolis extract to help repair, heal and soothe dry, cracked lips. This is definitely a nighttime treatment for me, but by the next morning my lips definitely feel more comfortable and smooth. 4. Amorepacific Moisture Bound Lip Treatment - As a stated above, my preference is a squeeze or twist-up tube for lip balms, so naturally this one was already winning in my book. 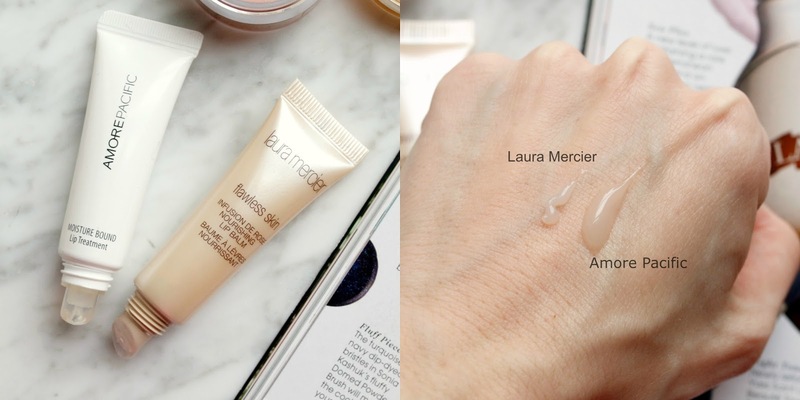 The texture is more emollient and jelly-like and I prefer this as an evening treatment because when I try to put anything besides a gloss or sheer lipstick over top, it slides right off. That being said, I reach for this on the nights that my lips are at their worst because it feels creamy and smooth, and doesn't disappear moments after applying. I find that my lips stay hydrated for quite a long time after, so only recently have I began carrying it in my makeup bag with me to help when it's super cold outside and I need a quite boost of comfort and hydration. 5. Laura Mercier Infusion de Rose Lip Balm - Again because of the ease of application, this one went right into my makeup bag the day that I received it. The formula is a bit stiffer, thicker and feels waxier, and any lipstick or gloss I put over it wears beautifully. It's a great mid-day touch up balm if my lipstick is looking patchy or dry - it helps to smooth out the color while still hydrating my lips. 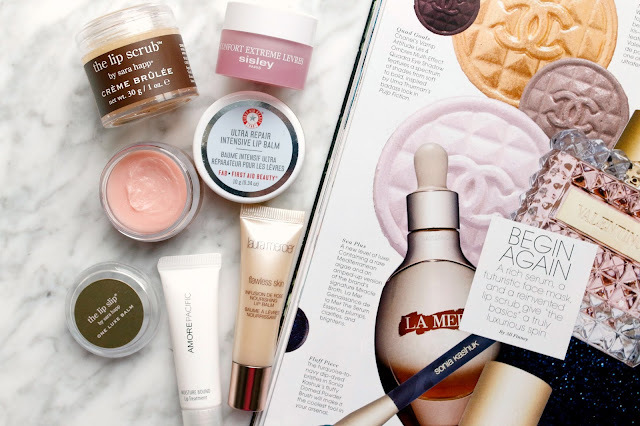 What are some of you favorite lip balms? Love this post! I also just posted about the FAB one. It's so strange and wonderful, haha. 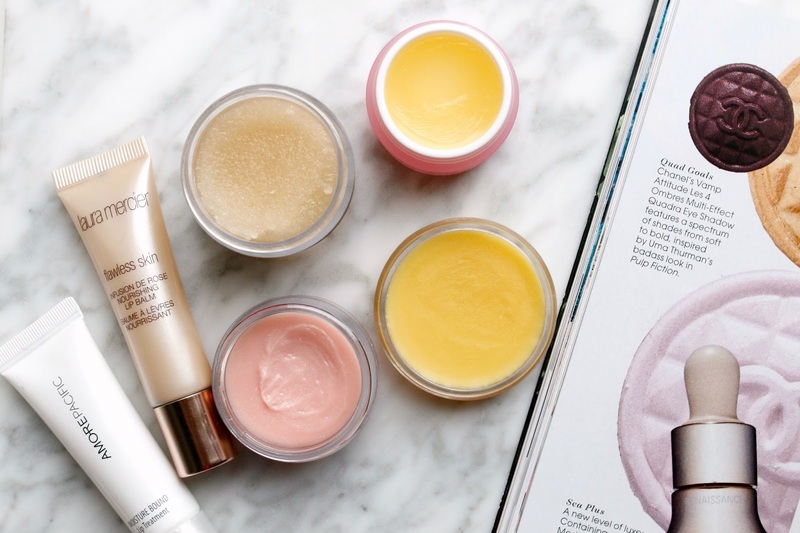 I have a major lip balm addiction, so I can't wait to try out a couple of your picks.